Happy birthday Nina Laden (Peek-A Who?) and Margaret Rostkowski (After the Dancing Days). It’s the birth date of Laura Adams Armer (1874–1963), Waterless Mountain, Clement Hurd (1908–1988), Goodnight Moon, and fairy-tale writer Charles Perrault (1628–1703). A long-distance radio message is sent from the Eiffel Tower for the first time in 1908. Read Dodsworth in Paris by Tim Egan. It’s Feast of Fabulous Wild Men Day. Go ahead and reread Where the Wild Things Are by Maurice Sendack. On January 12, 1876, Jack London was born in San Francisco, California. But the event that shaped London’s life occurred in 1896 when he was twenty. Three men who were fishing for salmon – Shookum Jim, Dawson Charlie, and George Carmack—found gold in Rabbit Creek, a small tributary of the Klondike River in Alaska. Because of their discovery, tens of thousands came over the Chilcoot Pass, swept up in the mass hysteria of the Klondike Gold Rush. Since sled dogs provided the only reliable transportation in this uninviting climate, dogs were stolen from owners throughout America and worked to death by those hunting for their fortune. At the age of twenty-one, Jack London also became part of the gold rush, not as a prospector but as a laborer, carrying bags and packages. This experience allowed him to make observations about the men and these dogs, which turned into his great masterpiece, The Call of the Wild. London chose to tell the story from the point of view of a dog, Buck. Weighing 140 pounds, Buck begins his life as a pampered pet. Kidnapped for service in the gold rush and beaten by his master, Buck struggles to survive. Although mistreated by humans, Buck is saved by a man and becomes devoted to him. In the end, however, Buck becomes part of a wolf pack, determined to live in the wild on his own terms. Although first published as an adult novella in 1903, the book quickly became part of the childhood canon, often read in school. As reading guru Jim Trelease says in Everything I Need to Know I Learned from a Children’s Book: “The Call of the Wild…[was] my home run book…. Like one’s first big kiss or first home run—they’re unforgettable, and we spend the rest of our lives trying to duplicate or surpass them.” For Jim, and so many children age ten to fourteen, this piece of virtual reality has brought the Klondike gold rush to life. My favorite edition of the book is the Scribner Classic, illustrated by Wendell Minor. His Buck looks exactly like I imagine him to be—although I may be partial. Wendell used a Bernese mountain dog as his model, and I share my life with members of this breed. 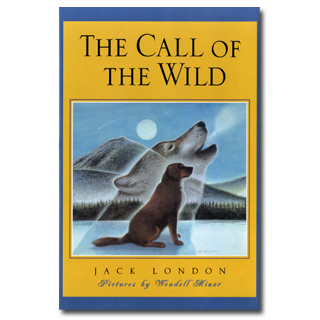 But whatever version you decide to pick up, there is still no better way to understand what happened over a hundred years ago in the Yukon than Jack London’s brilliant classic The Call of the Wild. Buck’s first day on the Dyea beach was like a nightmare. Every hour was filled with shock and surprise. He had been suddenly jerked from the heart of civilization and flung into the heart of things primordial. No lazy, sun-kissed life was this, with nothing to do but loaf and be bored. Here was neither peace, nor rest, nor a moment’s safety. All was confusion and action, and every moment life and limb were in peril. There was imperative need to be constantly alert; for these dogs and men were not town dogs and men. They were savages, all of them, who knew no law but the law of club and fang. Originally posted January 12, 2011. Updated for . I listened to Call of the Wild on CD just weeks ago. As an animal lover, I found the book quite painful to listen to. If that reaction is what London intended, it certainly worked on me. Personally, I couldn’t listen to this book again, or read it. Perhaps this comes from having lost a very special friend. A small collie. I have come to believe that being close to an animal may be the only way those who have been wounded in childhood ever fill that empty place of love, bonding and belonging, or the specific unconditional affection they need. There is something profoundly unnamable and healing about a thing like that. If you’re one of those, you’ll know it. Also, I somehow missed being aware of the Bernese mountain dog breed. I’ve seen them, but I didn’t know their name. so now I’ll do some research and learn all about them. All Creatures Great and Small. All Things Bright and Beautiful..
For appearances, my twelve-year-old body was in the back seat of a station wagon on a long car trip when I read Call of the Wild. But time and space had bent, and in those moments I existed completely in Buck’s Yukon. I love Jim Trelease’s characterizations of “home-run book” or “first-kiss book; this was definitely a first-kiss book for me, and the same transport of mind and heart occurred in my experiences with White Fang, The Sea Wolf, and The Iron Heel. Thanks for bringing me back there, Anita!! My son and I read Call of the Wild and White Fang together when he was in 4th or 5th grade. Fantastic books and very emotionally stimulating. I loved Call of the Wild, and it led me on to all lot of London’s other writing, especially the weather-heavy bits. Thirty-eight years ago, I read this book in the attic of a huge house on Govenors Island. My best friend and I were visiting her relatives, and it was my first trip to New York City. Reading this book was such an emotional experience, it is all I remember from that trip. I am a school librarian now, and try to get this book into as many hands as possible. I read Call of the Wild with my son last year – I’d never read it myself before and knew there was a hole there. It is a harrowing, stunning read. Will certainly look out for Wendell Minor’s illustrations. @G.Perry – I too love James Herriot’s books (and grew up with the TV series) and am now lucky to live in James Herriot country now. His old home/surgery in Thirsk is a fantastic museum.